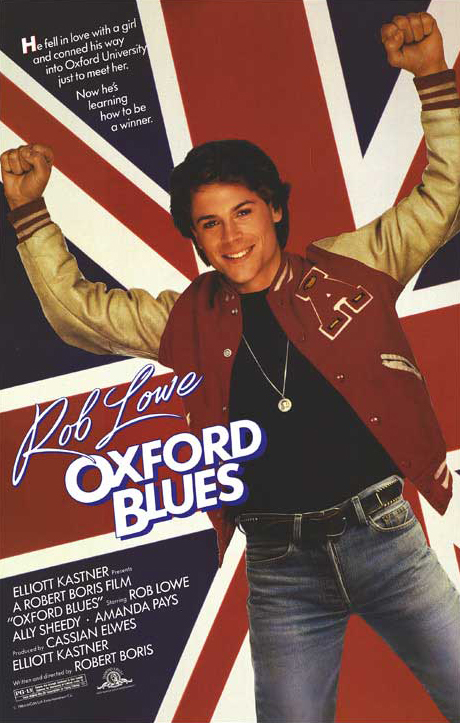 Oxford Blues is an awefome* modern remake of A Yank at Oxford (1938) from writer-director Robert Boris. Rob Lowe stars as Nick Di Angelo, an American parking attendant in Las Vegas who falls in love with the beautiful and classy Brit, Lady Victoria (Amanda Pays). He follows her back to England and learns that she is a student at the prestigious Oxford University. Determined to woo the object of his affection, Nick manages to con his way into admission at the school by paying a computer geek to hack into the system. With his douchey manner and egotistical worldview, Nick pretty much offends everyone he encounters, except fellow American and coxswain Rona (Ally Sheedy), who becomes his one and only friend. The movie opens with Nick and his father rowing in two single sculls, after which he carries both sets of blades off announcing "see you later" and leaves his poor dad to put both boats away on his own - douche. Early in the film, Nick arrives at the start of a sculling race – steals some dude's single and rows it to victory. Mind you, he leaps in wearing jeans, cowboy boots and a leather jacket. Let's also not forget the "snugness" with which jeans are worn in 1983. Can you say, "swampy?" In the final race sequence against Harvard, Lowe has a traditional rowing movie "oarlock incident" (these moments are obligatory if you want to have any rowing in a film, see "The Skulls"), when his scull pops out mid-race he simply puts it back in and they go on to victory. He does not jump out like 7 seat in "The Skulls" per Pacy’s order. Although, that would have been amazing considering they were racing a double. * awefome - awful, yet somehow awesome. Here is another great rowing movie, an English one, but a classic. You should totally do a review of this movie! Also--Notice the tag-line for True Blue? "To be second is to be last." Kind resonates with the central idea of Talladega Nights, don't you think? Sweet, you wanna do a review of that one and post it?